When your cranberries come straight from the bog, they tend to have sticks and leaves and things. But they are fresher and make better cranberry sauce. Which, of course, makes for the best day-after-Thanksgiving sandwiches. Have a great weekend and enjoy those leftovers! Fresh from the bog? Lucky you. I really had to pick through the berries this year at the store- many were soft and badly bruised or white. The leftovers are the best part! Enjoy yours too. Fresh from the bog? Lucky you. I really had to pick through the berries this year at the store- many were soft and badly bruised or white. Great photo. They look so pretty and must taste like heaven. No leftovers for us. We had a prime rib roast and polished off the whole thing! 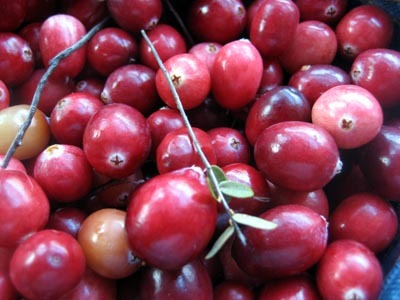 Your cranberries are making me homesick. Pretty. No bogs over here, so I’ll have to be satisfied with store-bought-fresh. How cool is that?! I’ve never even seen a cranberry bog except in pictures. I love it! I especially love the little “x”‘s on the end of them! Hmmmmm. I forgot to bring home some of the cranberry sauce with me from yesterday’s dinner. Might have to take a trip back to my mother’s house today after seeing your photo. It’s the Noro of the cranberries! hope your thanksgiving was wonderful! those pies are amazingly beautiful – it makes me think of the “pie song” from the movie Michael (grin). I’m not much of a baker, so my daughter brought desert – (creme brule!. I did the whole turkey meal, and it was delish ! Mmmm. I have some cranberries left from the pie — maybe some relish. Dammit, we’re bogless around here. What the heck? Those berries are beautiful. On Sunday I’m buying fresh berries for your pie recipe. Yum! My favorite part! Well, cranberries are right up there with the turkey and the pies for me, at least, and my favorite way to have a turkey sandwich is with a cranberry spread. I cooked mine up with apricot preserves and blackberry honey this year, but the cranberries still weren’t local. Yum! I love cranberry sauce from scratch. My fave fruit of the season!